Zillmer competes in the steeplechase at Nationals in Spring 2013. Senior special education major Kristen Zillmer is a standout cross country and track and field runner. Specializing in long distance running, she reached nationals in her junior year and was named a team captain for 2013-2014. But as her friends, professors, and coaches would tell you, the strides she has made in all aspects of her life while at Illinois State are the result of her tremendous character, not her running spikes. Despite the demands of being a two-sport athlete taking classes in an intense education major, Zillmer has found a way to volunteer on a regular basis on campus and in the community. She is vice president of the Student-Athlete Advisory Council (SAAC), and has lent a helping hand to Marcfirst, Recess Buddies, Easter Seals, Festival of Trees, Day of Dozers, and Reggie Fun Zone, among others. Just two weeks after receiving this award, Zillmer was also named a Missouri Valley Conference (MVC) Leadership and Service Award recipient. MVC student-athletes receive this award for demonstrating citizenship through sportsmanship and significant community service. Among those who have helped Zillmer balance her time among obligations at the University are Jeff Bovee, head coach of cross country, and Elvis Forde, head coach of track and field. For Forde, the student-athlete’s traits as an aspiring educator have always been apparent to him and have made their way onto the track. Zillmer talks with a student at Thomas Metcalf School during lunch. Zillmer’s natural ability to motivate others in practice and competition harkens back to a desire to appreciate people on a personal level and come to know what they care about. By applying this knowledge appropriately, she is able to get the most out of her teammates. This is a tactic she employs in the classroom, as well. Zillmer’s patience and persistence are among the many characteristics that have helped her to develop her abilities as a teacher. Her dedication to improve has been witnessed by many of her professors, including April Mustian, assistant professor in the Department of Special Education. 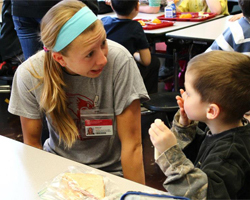 As her career at Illinois State enters its last few semesters, the successful student-athlete is in a unique position to impart words of wisdom for freshmen who aspire to be educators and compete in a collegiate sport. Coming from a student-athlete who somehow made time for everything, this promises to be among the soundest of advice.